In this unit we do some stable population calculations, including determination of the intrinsic growth rate, as illustrated in Box 7.1, and computing the stable equivalent age distribution, as illustrated in Box 7.2 in the textbook. We showed in the previous unit how to calculate r from the first eigenvalue of the Leslie Matrix. We now use the Egyptian example in Box 7.1 to illustrate Coale's method. We start by entering person-years lived for ages 15-19 to 45-49, the maternity function at those ages, and the midpoints of the age groups. The NRR is 1.527 daughters per woman, in agreement with the textbook. Next we solve Lotka's equation. The first thing we need is a little function f(r) to compute a discrete approximation to Lotka's integral (equation 7.10b in the text). We then use Coale's method, which approximates the first derivative f'(r) as minus the product of the function and the true mean age of childbearing in the stable population A, which of course is not known, so we use an estimate. The code below starts from r = log(NRR)/A with A = 27. After three iterations we agree with the textbook and after six the rate of growth changes by less than 1e-8. Newton converges a bit quicker, in only four iterations, and as a bonus we get the mean age of childbearing in the stable population, which is 29.47. Lotka used a quadratic expansion to obtain an approximate solution that does not require iteration. 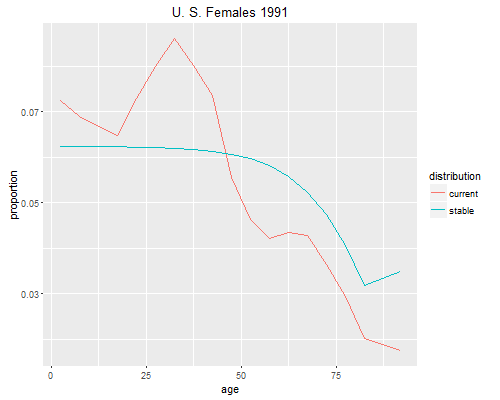 Let us now turn to the example in Box 7.2, which involves the female population of the U.S. in 1991. The data include the actual age distribution as well as the person-years lived and the maternity function. These are available in a text file called prestonBox72.dat in the datasets section. The first step will be to construct a Leslie matrix and compute the first eigenvalue and eigenvector. Make sure you first cut and paste the function to compute a Leslie matrix from the population projection log. The intrinsic rate of growth of the U.S. in 1991 was r = -0.0001665. If the observed fertility and mortality patterns were to prevail the population of the U.S. would eventually decline about 0.017% per year. The method converges very quickly and gives a mean age of childbearing in the stable population of 26.479. Note that there is a typo in the textbook, which reports r as -.00018 on page 150. 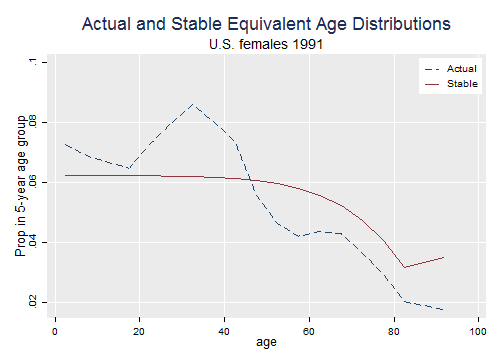 As you can see the do calculations of the stable equivalent age distribution give essentially the same result. Watcher's textbook explains why this is so. The graph reproduces Figure 7.4 in the textbook, showing how the 1991 age distribution has proportionately more people at younger ages (up to 40-44) and fewer at older ages (45-49 and up). Question: On our way to the stable age distribution we computed the intrinsic birth rate. What's the intrinsic death rate?